Behind the Scenes of: Chasing Quakes. Norcia and Amatrice are two of the towns in the central Italian region which have been hit very hard in 2016 by a series of quakes of high magnitude. While parts of Norcia are still operating, both as living as well as commercial and everyday-life areas, the core of Amatrice is a wasteland, where heaps of debris are towered by even taller heaps. 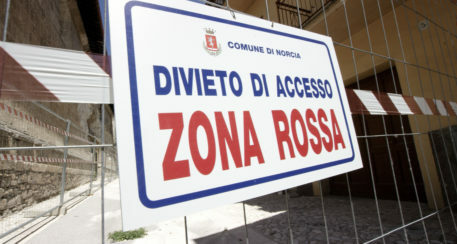 In these towns and many more towns and villages, these fenced off areas are called zona rossa – the red zones. It is forbidden to enter these zones without permission, and even if permission has been granted – for instance to former residents who may want to collect belongings from houses which have been declared safe to enter, however not to reside in, or to film teams who have stated their cause of wanting to get first-hand impressions for an upcoming science documentary – being guarded by one of the vigili del fuoco, the Italian firefighters, is necessary. For both towns, Amatrice and Norcia, our film team in Italy was given permission to enter and even film in the red zones. We were dealt mandatory safety helmets to wear and wherever we went, we were accompanied by one or more members of the vigili del fuoco. They also get alarmed in real time via beepers about any earthquakes in the area which might threaten the partially unstable neighbourhoods in which we were moving around. In these devastated areas, birds have already started to seize the opportunity to build their nests in new niches and crevices that have been created. Just by walking through, you could still grasp glimpses of the former residents’ lives, as rooms were halfway visible, toys, toothbrushes, magazines or furniture can still be made out. Comparing pictures from then and now is a gruesome task; where once people roamed, houses and stores were standing, you today find heaps of debris – which have been cleared away to create a network of new roads just to be able to access only more heaps of debris – and what once was the city of Amatrice. Find out more about ‘Chasing Quakes’ and watch the trailer as well as the whole production here.